Jared Unzipped: The Cadbury Creme Egg Ban. Who doesn't love a tasty Cadbury Creme Egg? If you happen to find someone that does not, they are clearly not to be trusted. I digress, though. Last year, a devastating change was made as to how many Americans and ex-pat Brits enjoy the sweet treat. Cadbury Eggs originally come from England, where they are produced by Cadbury UK. Under English food regulations, any item advertised as containing chocolate must possess at least 20% cocoa solids. In the United States, the same products are only required to have at least 10% cocoa solids. 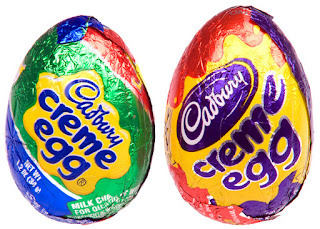 Up until last year, many American retailers would import British Cadbury Creme Eggs because they contain more chocolate, are larger and generally taste better than the American version. 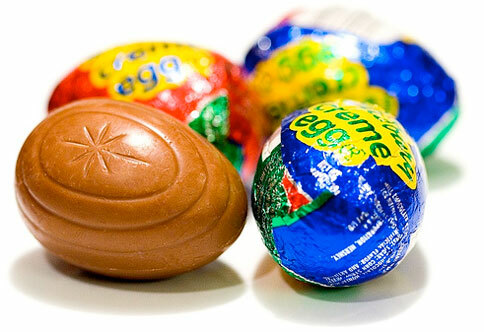 In the United States, Cadbury Creme Eggs are produced exclusively under license by Hershey. Pictured here is a size comparison between the American Cadbury Creme Egg made by Hershey (left) and the original British Cadbury (right). See the difference? A volatile lawsuit last year resulted in a ban on the import of many British chocolates, including the much loved Cadbury Creme Egg. Hershey claimed that the import and consumption of the original British version was 'confusing' for their consumers, as well as violated their exclusive right to produce and sell the Cadbury Creme Egg in the USA. Long story short, Hershey didn't like the idea of Americans eating the original version instead of their own inferior product. This isn't to say that the Hershey-produced Cadbury Creme Egg is bad; they still taste pretty darn good. Yet, they're not as flavorful as the original British version, which I've had the opportunity to try before. There is a dramatic difference. The Cadbury UK original has more of a creamy, robust chocolate shell. Alternatively, the Hershey version is much sweeter with a firmer shell. All of the Cadbury Creme Eggs you'll enjoy this Easter season will be the Hershey version -- slightly smaller and with less actual chocolate. In the end, the American Cadbury Creme Egg consumer loses.